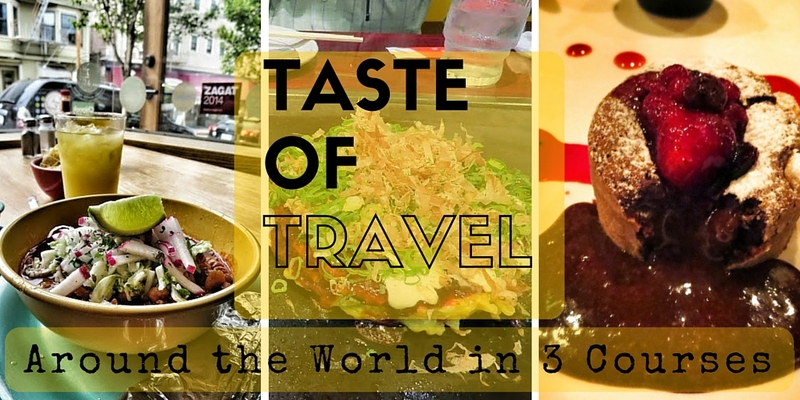 For me, food memories linger the longest from our travels so I was super-excited to receive the challenge to come up with a #tasteoftravel 3-course menu from Bunks and Beaches. This challenge was sparked by a competition put on by Celebrity Cruises. My menu may seem a bit disjointed but I wanted to give you a sample of some amazing foods across three continents rather than worrying about whether the foods go together into a cohesive meal. Ok...time to get your stomachs rumbling. 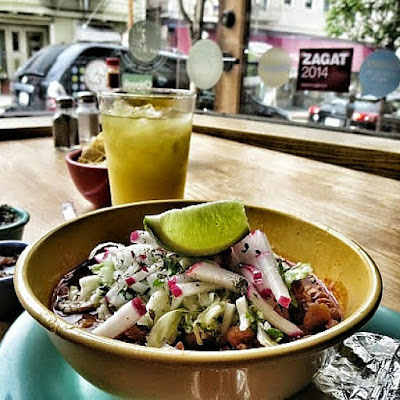 I could eat Mexican food three meals a day when I visit California. 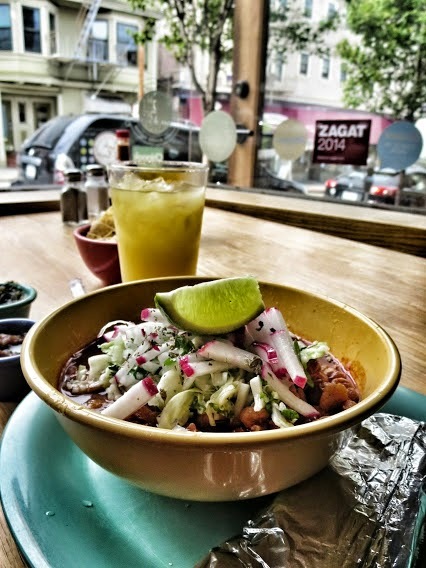 It should ideally be washed down with a margarita on the rocks with salt (well, maybe not for breakfast...). 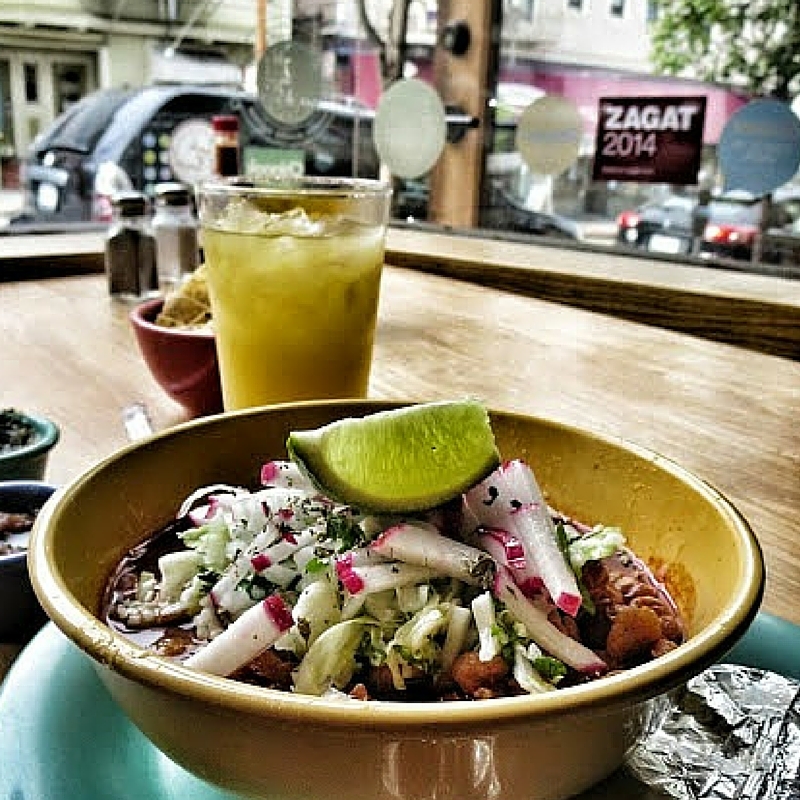 This pozole (a pork and corn based soup) and margarita with a hint of orange served in a pint sized glass from the Little Chihuahua in San Francisco is one of my fondest food memories of all time. We had the chance to visit Japan for the first time in 2014 and the food totally exceeded our expectations. Forget sushi for a moment. I present to you for your main...Okonomiyaki! This dish contains a little bit of everything and the best part is getting it at a restaurant that cooks it table-side so you can watch the magic happen. Okonomiyaki is kind of like an omelette, kind of like a pancake and can be filled with all manner of noodles, vegetables, and/or meat. It's then smothered in mayonnaise and a savory BBQ sauce and topped with bonito fish flakes (tastier than it sounds). 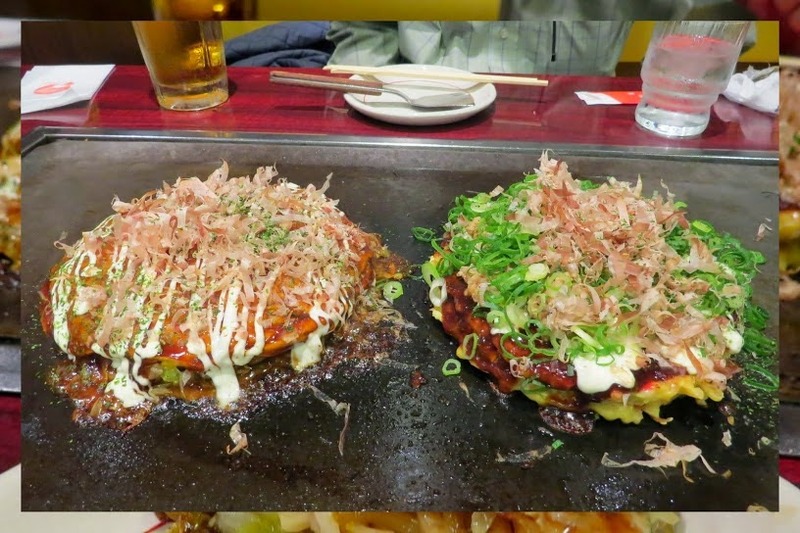 We tried Okonomiyaki at Okonomi Yukari not far from the main train station in Osaka. For dessert, we'll fly from Japan to my home base in Dublin, Ireland. I'm a chocolate girl so I'm going with a classic to round out the meal...warm flourless chocolate fondant with a viscous liquid center. This specimen from Blackboard Bistro is one of my favorites. They don't always have it on the menu but whenever they do, we're there! I hope you've enjoyed this round the world dining experience! I plan to invite some of my favorite bloggers (Our Tasty Travels, Wanderlust Marriage, and Travel Sandwich) to participate. Can't wait to see what they come up with. An imagined 3-course menu curated from favorite foods from around the world.